Corona, CA – Manbat Battery Power Systems, a U.S. Battery Manufacturing dealer in the United Kingdom, is the major supplier of batteries to A-Plant, one of the largest equipment rental companies in that country. "We are the preferred supplier of batteries to A-Plant in its entirety, and including all divisions," says Myles Pemberton, Marketing Manager for Manbat Ltd. "A-Plant and many of our other customers think U.S. Battery products are by far the highest quality and best performing batteries in the market - bar none. They have a fantastic reputation here in the UK." In the competitive deep-cycle battery market, U.S. 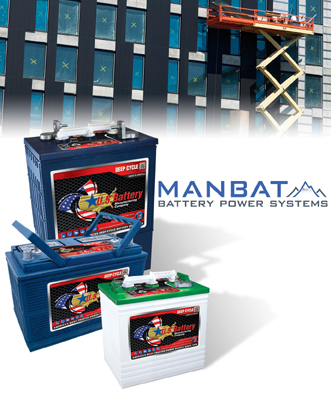 Battery provides technical and marketing support, so dealers like Manbat can achieve a higher level of success. "U.S. Battery supports us in many different ways," says Pemberton. "From helping to fund trade shows, supplying images and graphics for point of sale leaflets, and promotional items for us to use at trade events. It's all done quickly and efficiently, and we feel we have a team behind us, helping our company along the way." Manbat Battery Power Systems has 12 locations and makes daily deliveries to its customers across the UK. The company has been a battery supplier since 1952, and serves multiple markets including Golf Car, Automotive, Commercial, Marine, Industrial, VRLA and more.